Daniel Larsen was released from prison in 2013. After a lengthy battle with the state and federal courts, the Ninth Circuit Court of Appeals denied the Attorney General’s appeal. In March of 2013, in Los Angeles, Federal Magistrate Judge Suzanne Segal ordered Danny’s immediate release. Fourteen years after his wrongful imprisonment for possession of a knife, he finally became a free man. In 1999, Daniel Larsen was convicted of possession of a concealed weapon after two police officers testified they saw him toss a knife under a nearby car in the parking lot of a bar. Unfortunately, Danny’s now-disbarred trial attorney failed to discover as many as nine percipient witnesses, including a former Chief of Police from North Carolina, who saw another man, not Danny, toss the knife. Danny’s trial attorney did not call a single witness, and as a result, Danny was convicted and sentenced to 27 years-to-life in prison pursuant to California’s Three Strikes Law (Danny had prior convictions that occurred nearly a decade earlier). During our post-conviction investigation, we gathered statements from many of these witnesses and presented the evidence to the California courts who summarily denied each petition. Then, we went to federal court, and eleven years after his conviction, a federal district court took the case seriously, held an extensive hearing, reversed the conviction, and ordered him released. The court found that Danny was innocent, the police officers who testified at his trial were not credible, and his trial attorney was constitutionally ineffective for failing to call witnesses on Mr. his behalf. Before Mr. Larsen was released, the Attorney General appealed the judge’s ruling. The Attorney General’s main argument was that even if Danny was innocent, his conviction should not be reversed because he waited too long to file his petition. In other words, an innocent man should spend his life in prison due to a legal technicality. 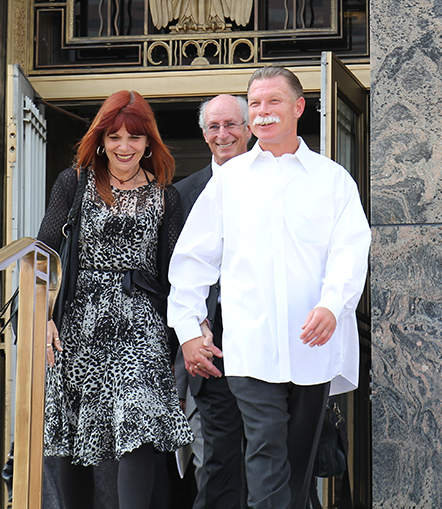 Almost three years after his exoneration, the Ninth Circuit Court of Appeals finally decided to release Danny. Although the status of his exoneration will remain in limbo pending the Attorney General’s almost certain appeal to the United States Supreme Court, Danny and CIP are celebrating. As with all of CIP’s successes, this was a group effort, and it could not have been done without the tireless efforts of many of our staff and former students. My Co-Director, Jan Stiglitz, led the charge in Danny’s federal case, and successfully argued in front of the Ninth Circuit. CIP staff members Alex Simpson, Alissa Bjerkhoel, and Kim Hernandez also put countless hours into the case. Former CIP students Tara Meath, Paul Spencer, Kyle McMillan, Michele Kumaus, Mike Semanchik, Shannon Sebeckis, Lara Easton, Jake Greenwell Grillot, and Wendy Koen all worked on the case in their years in the clinic, and their contributions were essential.